While there is a plethora of books available that provide tips on Web design, most authors leave a significant gap between the theory and practice--a gap that is left up to the reader to fill. Homepage Usability: 50 Websites Deconstructed boldly steps into that gap with specific observations and suggestions backed with solid quantitative analysis. This book focuses only on home page design as the most important point of presence for any Web site. This definitive work is coauthored by Jakob Nielsen--the accepted industry expert in Web usability--and Marie Tahir, an expert in user profiling. Their collaboration has produced a guide of such rare practical benefit that Web designers will likely wear out their first copy scouring the pages to savor every last morsel of wisdom. The book begins with a chapter of precise guidelines that serve as a checklist of the features and functionality to include on your home page. The specifics found in categories such as "revealing content through examples" and "graphic design" will quickly hook you and whet your appetite for more. These guidelines are followed up with hard statistics and an examination of the ominous Jakob's Law: "Users spend most of their time on other sites than your site." Here you'll find some interesting statistics about how various conventions like search, privacy policies, and logos are used. All this leads up to the showcase element of the book--a systematic deconstruction of 50 of the most popular home pages on the Web. The authors painstakingly pick apart each in an uncompromising autopsy of usability. Each site is graphically analyzed for its use of real estate and summarized with the frankness only found from true experts. Then each section of the home page is bulleted and analyzed for potential improvements. Topics covered: Design guidelines, convention usage, screen real estate, navigation, content presentation, search facilities, links, graphics and animation, advertising, news, customization, and customer feedback. Jakob Nielsen is out to change the Web, one page at a time. 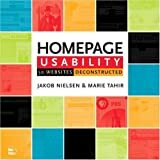 His latest book, “Homepage Usability” coauthored with Marie Tahir, takes on the most important page of your site, the home page. Now that Nielsen and the usability community have “defeated bad design” by reducing “user-hostile” design practices they are fighting for good design. What better place to start than your own home page? The authors present 113 homepage usability guidelines that will make your site easier to use, and apply them mercilessly to 50 popular sites. This book is part of a strategic campaign against the “enemies” of usability. The members of the Nielsen Norman group, a veritable who’s who of usability and design gurus, realize their Fortune 500 fees are too high for most small to mid-sized companies. They are leveraging themselves accordingly to spread the usability gospel by giving world tours, seminars and tutorials, writing books, granting interviews, and teaching other designers about usability so design teams can help themselves. The home page is a company’s public face to the world, and is often the most popular page on a site. Spending more time to get it right is time well invested, as usability improvements can yield two or three-fold increases in conversion rates. The problem is, there is only one home page for each site, so conflicting forces like sales, design, and marketing invariably vie for its attention. The challenge is to design a homepage that allows access to all of your important features without cramming them all onto the page itself, overwhelming new users. Tag lines should be brief and concise. TITLEs should begin with the company name for bookmarkability, followed by a good tagline. Avoid using “online” or unnecessary articles (“the” etc.) Don’t include “hompage” or “online” in the title. Limit titles to less than 64 characters. Optimize content for easy scanning. Be clear use consistent capitalization. Hire a copy editor. Avoid exclamation marks!! Use examples to reveal the site’s content, rather than just describing it. Examples instantly communicate what the site is about. Be specific. Search is one of the most important elements of the homepage so make it visible, wide, and simple. Provide a wide (25 char) input box on the top right or left of the home page. Use a “Search” button only. Search the entire site by default, users are confused by scoped searches. Don’t search the Web, that’s what search engines are for. In order for them to work, you need to craft effective headlines and decks (story summaries). Give specific information, don’t tantalize with hype. Headlines should be succinct, yet descriptive, to give maximum information in as few words as possible. Write and edit specific summaries for press releases and news stories that you feature on your home page. Don’t just repurpose the first paragraph of the full article. Link headlines, not decks, to the full story. Use them sparingly as they invariably draw users attention. Never use widgets for parts of the screen that you don’t want people to click. Make graphic bullets clickable. Avoid using multiple text entry boxes, users confuse these with search. The authors also quantify homepage design conventions by tallying up the design stats on the 50 sites reviewed (page width/length, download time, search, wording conventions, etc.). Since most users spend most of their time *off* your site, the authors advise us to follow common Web design conventions. Don’t fight your users’ mental model unless you have a very good reason, and can back it up with user testing. At $10,000 per home page review, Nielsen says this is a 1/2 million dollar book. I wouldn’t put the price quite that high, but it is invaluable. You only get one chance to make a first impression, this book will help you ensure it’s a good one. Highly recommended. This book serves as a follow-up by the world’s guru on Web Usability, Jakob Nielsen, two years after the release of his successful “Designing Web Usability.” This time around, he picked up where he left and expanded on his previous work on Usability, by selecting the Internet’s 50 most important properties, and deconstructing their Home Pages: Amazon, [other websites], you name it! They’re all there, and he’s very critical -sometimes a little too much, in my opinion, since (as we all know) in the world of design, compromise is one of the unavoidable evils. Check out the book, though. You will find a wealth of very useful ideas and criticism you can directly apply to your Home Page. To me, a Web Project Manager, this book came in VERY handy, allowing me to convey some basic Web design concepts accross the board in my company. At this point, we have applied several of Nielsen’s ideas to our two web sites with extreme success, while educating managers in areas outside of IT about why certain ideas for a web site won’t work, while others have gotten to the point of becoming web design standards. Get it: it will become your biggest ally. This is an important addition to any web/usability professional’s library. Jakob Nielsen and Marie Tahir (of the Nielsen/Norman group) have created an extremely readable analysis of 50 “big-time” website homepages. As a credit to the authors, a random flip through the analysis pages will bring you a gem of wisdom, or a bit of dry, (occasionally sarcastic) aesthetic humor. The first fifty pages (or so) is devoted to homepage guidelines… the statisical review could be very useful for redesigning a homepage around best practices. The final 200+ pages are devoted to critical analyses of specific homepages including staple homepages from Amazon, IBM, Microsoft, and Yahoo, to a more eclectic selection like the Art Institute of Chicago Museum, Asian Cuisine, and the Florida Department of Revenue. The reviews were about 4-6 pages each with at least two full screen prints. The second screen print also had an enumerated “key list” with a corresponding pithy description on each usabilty issue. There are a few usability ‘motifs’ that stand out in the analyses. I think you will find the issues cover a wide range of “common” usability problems. Some of critical comments felt a bit like nitpicking or perhaps the author being a bit “hyper-critical”, but most were spot on. Slavishly “fixing” every item mentioned in usability critique doesn’t necessarily improve homepage usability, fixing the majority will … and there are plenty of useful tips, and good advice to take back to the design shop. Superlatives fail me when describing the value of this book. It is no exaggeration to say that it is worth millions of dollars in the increased efficiency of web sites. Which may even be true if the recommendations are made to only the fifty sites examined in the book. The authors critique some of the biggest sites, such as Microsoft, Yahoo, Wal-Mart and eBay and a significant number of the errors are surprising in their obviousness. For example, many of the pages have titles that will be alphabetically indexed under words such as “The” or “Where.” Others place the word “Online” in the title, which is of course the only way the page will be seen. Nielson is an outspoken opponent of any descent into cutesy images or dialog and he makes his points very effectively. I examined the first few pages very carefully before going on to the comments, trying to determine what difficulties the pages may present. Some were found, but most passed me by. However, after reading the author comments, I went back and looked at them again. When I did that, it was clear what the problem was. My examination was done from the perspective of someone who was experienced in web design and who was not actually using the site to do anything critical. Which is no doubt the reason for the problems and why the authors should be listened to. Nielson and Tahir have that incredibly rare ability to think like a novice while possessing the knowledge of an expert. Some designers may read their comments and consider them picky. Which is true, but only from the designers perspective. Looked at from the viewpoint of a user who wants something right now, they are a frustrating annoyance that is unnecessary. One that I find particularly aggravating is the size of search boxes. For some reason, the designers seem to think 15 characters is enough. Adding a few more characters to the size of the search box does not burn that much additional space and allows the user to see most of their entry. Few of the recommendations in the book would require a major redesign of the site. I took one site and went through a simulated alteration of the code so that it conformed to the recommendations by the authors and was able to complete nearly all of the changes in less than four hours. In contrasting the modified site to the original, there was no doubt in my mind that the altered site was a significant improvement. This book should be mandatory reading for anyone with a license to make a web page. It explains in simple detail what makes web pages work and simple problems that make them a pain in the personals to use. At the beginning of Homepage Usability is a big list of informative guidelines for creating a a useable homepage and a few pages devoted to homepage design statistics — showing what other people are doing, but that’s not this book’s raison d’etre. It’s the usability critiques — I found it absolutely invaluable showing these 50 websites next to eachother. Some of the advice seemed unbalanced and a lot was repeated, but the authors really dissected each site thoroughly. At times the authors seemed to dispense anti-graphic design, lowest common denominator advice which may get you fumiing like it did me…but fortunately that is kept to a minimum. Two gripes: One, something that was missing from the book that I would have liked to have seen is perhaps a simple chart or scale showing from 1-10 how “usable” each website is, to complement their critiques. Second, one of the sites that were reviewed was going out of business — what’s the point? In my research of writing my You Are Here Internet Guides, I have personally visited and toured well over 15,000 Web sites and I must say I find this book very impressive. A flawless job of deconstructing these 50 sites makes you want to look more introspectively at what visually stimulates viewers. It explains in detail what insightfully makes Web design sufficient and efficient for the viewer. The commentary is very easily spoken and will make you think twice about some characteristics of Web design. Things you may have normally taken for granted in Web design are pointed out. For instance, intricacies such as arrows pointing at words and how to keep it simple with text links make the user well informed. Or how some redundancies keep the user from reading more, and in turn decrease the impact of the intended marketing message shows that somes sites may be susceptible to overusability. The book takes the word “clutter” and defines it, and explains ways around it. The simplicity concept is explored deeply, explaining a site can be easy to use without sacrificing good content. I like how each site deconstructed has a pie chart that tells you can quickly and easily look at and see what the homepage allocates space for. Much thought put into critiquing the sites. I found the homepage design statistics in the beginning to be quite useful and accurate. Overall, the book is a masterpiece. There is a chock full of thought into each homepage. His last book on the practice of simplicity was just a tease. Workers charged with the responsibility of making Web GUIs need more than pontification with sparse metrics and predictions of how great monitors “will be” in 2001. (1) Take a site (you’ll recognize a bunch) and give an overview in terms of what it is trying to accomplish. (2) Show metrics and comparisons on how screen space and controls are used. (3) Begin the fun in earnest with specific recommendations and focused criticism. The devil is in the details, and here is where we come away with the stuff that makes this book a valuable bargain. Opinions and advice Fortune 500 companies pay wads for are ours for the price of a book. You don’t have to agree with Nielsen on anything at all. I battle usability questions daily at work and know the trade-offs in every GUI decision. Nielsen is neither right nor wrong — but he is certainly listened to by any Web worker who must come to grips with these issues. By the way, the construction of the book itself is spectacular. I left it on my desk at work and it sucked people into my cubicle with its shape and color. And, surprisingly, not one of the screenshots of the analyzed Web sites I checked is out of date. There was no skimping on this book at all. This book shows why Jakob Nielsen is so highly respected in the field of usability. The first part of the book contains the principles and concepts used for properly designing Websites. They are very detailed and very complete. The second part of the book contains critiques of 50 different homepages. Most of the homepages are from medium to large companies (FedEx, Accenture, …), but there are also a few from local companies. Nielsen sticks with the homepages because it’s the most important page on most sites, and the homepage tends to reflect the structure of the rest of the site. Nielsen points out the good and bad aspects of the homepages. He also does it in a very clearly designed graphic presentation. He numbers the areas of the homepage he wishes to comment on, then follows the graphic homepages with pages of comments clearly cross-referenced to the numbers. A very easy to follow format that I will use in my own presentations from now on. Easily done using layers in Paint Shop Pro. This section of the book shows how few companies actually follow good usability practices. In fact, some of the companies that supposedly help other companies develop a Web presence actually have atrocious usability practices on their own sites (the Accenture site is particularly hideous and poorly structured, although they have improved it slightly since the book’s release). The mistakes are common among designers, so Nielsen tends to be a little repetitive. Not really something he can avoid since the common mistakes are made by the page designers and they must be pointed out. We all know how bad Web design currently is because we’re continually looking for things or confused by the structure or navigation of newly visited Websites. Using Nielsen’s examples, any designer should be able to greatly improve their design practices. At least they’ll be better than the designers at most of these 50 companies. Along with Steve Krug’s Don’t Make Me Think and Alan Cooper’s The Inmates Are Running The Asylum, this book stands at the top of the heap of usability books. And it’s a better tool, especially for quick reference, than Nielsen’s last book, Designing Web Usability. Until you have pointed out how popular websites have horrible flaws you just don’t notice it. We rarely see good sites (and the distinguish quality of a good site is you don’t get distracted and notice it is good) so it is hard to expect better. But this book insightfully shows what is wrong with websites. Once we see what’s wrong we can recognize it and then we can FIX it. Even though a lot of this is on what not to do, getting those basic errors fixed may make this the best book I’ve ever seen on how to make a GOOD website, or at least improve any web site. For Web developers and consultants, this book is excellent for fine tuning the most important page on your site… your home page. The first section of the book is a list of 133 guidelines. Each and every one of these guidelines are extrememly useful. However, I wouldn’t treat them as the gospel that Nielsen regards them. This book works well to examine your existing site, as well as, seeds for new ideas. It also helps when talking with non-design types to have examples of ideas and principles.